If you're well prepared, the test should be very straightforward. It'll last around 38 to 40 minutes and is conducted by a DVSA Examiner. First off, the examiner will test your eyesight by asking you to read a number plate from a distance. Before starting the car, the examiner will ask you a 'Tell Me' Question, sometimes while walking to it, or standing near it. (please see Learner Resources Tab/Lesson Plans in the drop down menu for these). Before setting off, the examiner say this pre briefing to you. " The test will last about 38 to 40 minutes and will include about 20 minutes of independent driving and various roads and traffic conditions. I will ask you to complete one manoeuvre and we may carry out an emergency stop. The sort of things you’ve been practising with your instructor or accompanying driver. During the Test you will be asked to perform a "show me" question ie: they may ask you when it is safe to do so, 'please clean the front windows with the wipers using the screen wash' or please turn on the rear demister. For about 20 minutes of the test you'll be asked to drive on your own without any help from the examiner while the car is moving. You may be asked to follow the directions of the Sat Nav that they provide, which will have a pre programmed route for you to follow. You won't be able to follow your own. This will give you the chance to travel much further away from the centre so you may well drive in areas you have never seen before which will prove you are not just memorising test roads and routes. Only 1 in 5 tests will not involve the Sat Nav. If used the Sat Nav will be programmed by the examiner so it doesn't matter which type you train with. If the Examiner decides not to use a sat nav for independent driving, they may ask you to park the car and will give you up to 3 directions to follow such as "Take the next left, 2nd right then 3rd right". They may alternatively just ask you to drive to the nearest train station or an area of the city, which will be sign posted. For some of these directions you'll be given a very basic diagram such as shown below to help recognize the layout of the roads you'll come across. The examiner can write down the place name so you know how it's spelt on signs, if you want them to do this then just ask. After each set of directions you'll be asked to pull over and given another set. 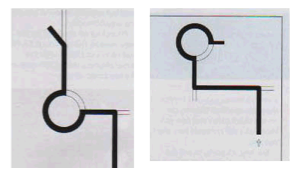 Here are some samples of the kind of diagrams you'll be given. You are not marked on going the wrong way. It doesn't matter how many wrong turns you make or if you end up in completely the wrong place. The worst thing you can do on this part of the test is to suddenly change your mind. Let's say you're approaching a left turn and at the last minute you see the sign saying that's the way you want to go. Carrying on will just mean you take a different route, suddenly braking and swerving can cause chaos. You are only marked as normal, your destination is irrelevant. If you start to go the wrong way, just carry on and then the examiner will help you get back on track. If you're coming up to a roundabout and you miss the sign, just say you haven't seen the sign and go left or continue in whichever lane you're in. You will not fail, you will not be marked down. The whole idea of this part of the test is to simulate being on your own and there will be plenty of times when you miss signs or go the wrong way, it doesn't matter! Reversing Manoeuvres - You will only do one reversing manoeuvre on the test. Parking on the right hand side of the road and reversing a couple of car lengths and then rejoining the road. "Everyone gets a little nervous for a test, but don't let it affect the outcome. You're trained well, so the test will be straightforward and, since you can drive, you'll know all the answers to the test!